Our offices are located at 5211 N. Williams Avenue, at a location with a long history tied in to North Portland. 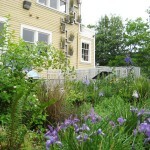 We retrofitted the house and the yard to save water and energy, and to demonstrate naturescaping, rain gardens and more. You can explore our building’s history, its features and the transformation of the demonstration yard in this section. Both our EMSWCD grounds and our District office are ADA accessible. Our office is served by bus lines #44, #72 and #6. For those traveling by bike, our location is also along a bike corridor, and we offer covered bike parking. If you would like to visit us and require any Americans with Disabilities Act accommodations or translation services, please call (503) 222-7645 no later than 48 hours prior to your visit. 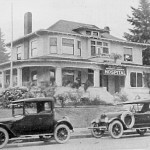 A photo from 1924, when the Sollars residence became a hospital. 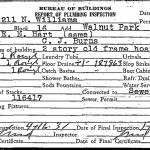 A permit from 1937, while the building was a maternity hospital. When the EMSWCD offices were relocated, we chose a vacant two-story building with a large yard and a rich history spanning over 100 years. First built in 1904, the building was originally a family residence. In 1924, it was transformed into a women’s hospital and maternity ward, which it continued to be for nearly two decades – the Drs. Hart & Hart Maternity and Surgical Hospital, Inc. In 1951, the hospital property was sold, and it became Vann’s Mortuary in 1954. It was the first African American funeral home in Oregon, and Mrs. Roberta Vann was also the first licensed female mortician in Oregon. When we moved our office here, we left the building’s form largely intact, although we did a seismic retrofit and installed many features that would save water and energy, and reduce the need to heat or cool the interior (see full list of features below). The yard was mostly unlandscaped, consisting of weed-filled lawn, an old asphalt driveway and river rocks on the front-facing slope. Thanks in part to a Metro Nature in Neighborhoods grant, we’ve installed demonstration naturescaping, rain gardens, pervious concrete, pavers set in sand, lawn alternatives, downspout planters, flow-through planters, and even a composting toilet. Now when we teach about the benefits of these water saving practices, we can literally walk out the door and show folks a working example! At the same time, we’re providing much needed green space to an under-natured neighborhood. The extensive landscaping, wildlife habitat, and downspout art further enhance the livability of this historic neighborhood. Check out the gallery Transforming our yard to see just how much the property has changed! View of the Williams house from the garden. Our natives don’t stop at Oregon grape! We have planted over 100 different native species to showcase their color and variety. 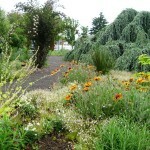 Native plants need relatively little or no watering, fertilizing, or care once established. They are also less susceptible to pests, and they attract a variety of native birds and butterflies. Plants with similar tastes in water and light are grouped together to further reduce water and maintenance. 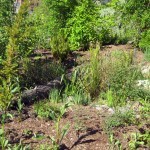 Naturescaping reduces water use, stormwater runoff, and pollution without sacrificing splendor. It also saves time, money, and energy while providing a beautiful habitat for birds, wildlife, and the people that live near it. Water from our downspouts and the downspout planter runs into rain gardens that hold stormwater runoff from disconnected downspouts and allow it to soak into the ground naturally. This helps reduce the amount of pollution that makes its way into our streams. 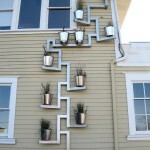 The top bucket of our downspout planter collects runoff from the roof of the building. Each planted bucket takes a turn carrying and passing stormwater to the next until it reaches an outfall at ground level where the water flows into a rain garden. The planter mimics some of the ecological functions of a forest. 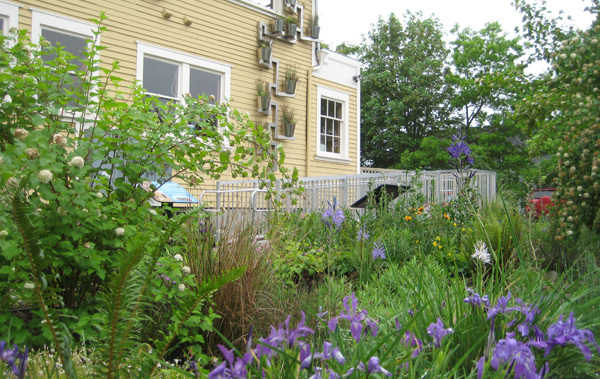 The plants of the Bucket Brigade drink up and transpire some of the stormwater from the roof, the rest meanders down and soaks into the earth or evaporates, rather than ending up in the city’s overloaded stormwater system. Stop by during our business hours and ask for a tour or watch one right now! 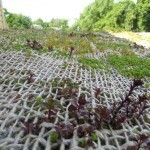 The plants and soil on the ecoroof help absorb rainfall. 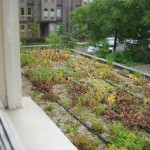 In addition, the vegetation helps cool the air and reduces the summer temperatures on the roof. 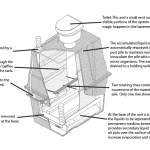 Another added bonus is that the ecoroof layers protect the roof from the elements and could double its lifespan. An ecoroof weighs significantly more than a conventional roof, so it was necessary to make significant structural reinforcements to the building to be able to handle the weight of the plants, water, and soil. Learn how our ecoroof was built in this photo gallery! Watch our “Ecoroof Science” video! As far as water is concerned, it’s like this parking lot isn’t even there. 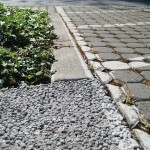 Rain flows right down through the pervious concrete, between the pavers and deep into the ground. That means no runoff, which is much better for rivers and streams. Our composting toilet uses natures’ natural processes to handle human waste without needing to flush it away with valuable potable water. It is a miniature, on-site waste treatment plant right beneath your feet. And best of all, unlike a latrine, it doesn’t generate any bad smells! Cloth hand towel dispenser (these hand towel dispensers operate like paper towel dispensers, but cycle through a long loop of cloth towel. When the loop has run through to the end, it is removed and washed for reuse. 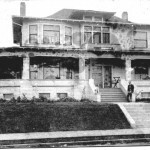 Do you have any anecdotes about the North Williams neighborhood or our building’s history? We would love to hear about it! You can contact us, or just stop by!